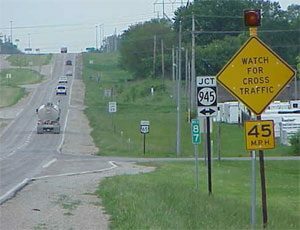 This report presents a national synthesis of rural expressway, two-way stop -controlled (TWSC) intersection safety strategies and intersection designs and an analysis of Iowa expressway TWSC intersection crash characteristics. A rural expressway is a multi-lane highway with a divided median and with mostly at -grade intersections, although some intersections may be grade separated. The synthesis of intersection strategies is conducted in two parts. The first is a literature review and the second part is a national survey of strategies currently being applied by state transportation agencies. The characterization of crash patterns at TWSC expressway intersections is examined through the analysis of 5 years of crash data at 644 intersections.